If FIFA, the governing body of international soccer was smart, it would promote “Early Man,” a cartoon movie highlights the way the beautiful game should be – one of teamwork, passion and the belief that anybody can beat anybody on any given day – leading to the World Cup. 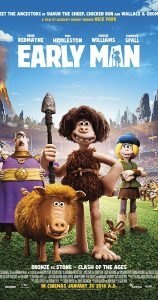 “Early Man” is the classic tale of how the longest of long shots – a clan of Neanderthals called the “Brutes” tries to do the impossible by taking down the world’s best soccer team, “Real Bronzio.” In today’s soccer terms, it would be like Saudi Arabia beating Germany to win the World Cup, but in “Early Man,” the Brutes are playing for something much bigger than a trophy: their livelihood. “Early Man” uses soccer to symbolize plenty of positivity – love, family and teamwork – and plenty of negativity – oppression, corruption and discrimination – in a fast-moving, 89-minute film. “Early Man” begins by introducing dinosaurs minutes before a meteor crashes into the earth and makes them extinct, though – miraculously – all the cavemen survive and are attracted to a still-smoldering sphere of meteor. Since it’s too hot to pick up, the Neanderthals kick the rock and just like that, soccer is born, with the sport’s fundamentals preserved as hieroglyphics. Suddenly, the movie fast-forwards a few centuries to the end of the Stone Age. The sport has been largely forgotten, as the valley’s lone tribe spends its days hunting rabbits. 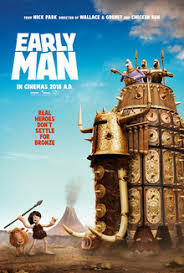 But one day, the cavemen are forced to flee from their home by the ruthless Lord Nooth (voiced by Tom Hiddleston), whose people are thriving in the Bronze Age. Nooth orders his men to turn the valley into a mine. With his people homeless and forced to survive in a desolate area that had been devastated by the meteor strike, a boy named Dug (voiced by Eddie Redmayne) sneaks into Nooth’s bronze-clad city to learn about the new world. Soon, Dug is discovered and before he’s to be executed he makes a bold claim: his clan of caveman can beat Real Bronzio in soccer, though he knows no one in his village had ever played the game. Nooth – a money-hungry politician envisioning the ticket revenue the match would generate – agrees to the game and its two stipulations: if the under-seized and under-manned Brutes win, they’ll regain possession of the valley, but if Real Bronzio wins, Dug’s tribe spends the rest of their lives underground, mining for precious metals for Nooth. If you’ve watched “The Might Ducks,” “Little Giants” or “Kicking & Screaming,” you know what happens: miraculously The Brutes go from being unable to kick a ball to becoming pretty good. But are they good enough to beat Real Bronzio? What makes “Early Man” so refreshing is that it’s a pure cartoon flick – not one of those cartoons that filled with computer-generated imagery. The Brutes, which include Chief Bobnar (Timothy Spall), Ttreebor (Richard Ayoade), Asbo (Johnny Vegas) and Dug’s adorable pet hog, Hognob (Nick Park), complement each other well. The script is full of jokes that adults will find witty and kids will understand. 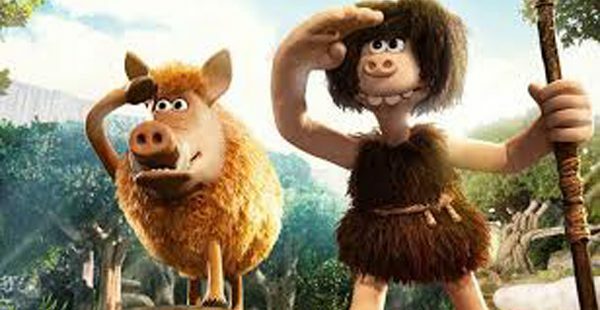 “Early Man,” which has been promoted more of a Stone Age against Bronze Age film in trailers, is, at its core, a sports movie. 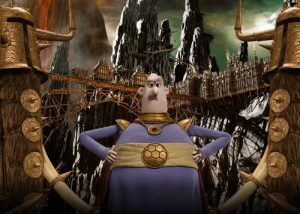 The film is the brainchild of Aardman Animations, which was behind the disappointing “Shaun the Sheep Movie” that made fewer than $20 million at the U.S. box office. It’s puzzling why the studio picked this weekend to open the film, which could have benefitted from being released closer to June’s World Cup and promoted as more of a soccer underdog story. But instead, it’s hitting theaters against “Black Panther,” which has been getting rave reviews, and the animated-live action film “Peter Rabbit” that will also offer stiff competition at the box office, making it quite possible that “Early Man” was released a little too early.